Rendering of Nokian Tyres' planned Dayton, Tenn., plant. A Finnish tire maker plans to build a $360 million plant in Dayton, Tenn., to expand its sales across North America. Nokian Tyres, headquartered in Finland with a North American sales office in Vermont, plans to hire 400 workers to produce 4 million tires a year in the first phase of its new tire production plant and the company could add hundreds of more workers in future expansions, officials said Wednesday. "With this investment, we will get the needed capacity for growth," Nokian Tyres' Chairman Petteri Walldén said in a statement Wednesday. "And while the Dayton factory clearly enables us to serve our North American customers better and more efficiently, it also improves our production capabilities and customer service throughout our global operations." Gov. 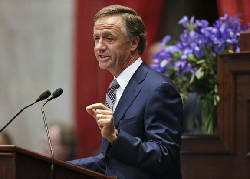 Bill Haslam said the project represents the largest direct foreign investment in Rhea County history and will focus on manufacturing passenger, SUV and light-truck tires. "Nokian Tyres' decision to locate its new operations here is a tremendous win for Rhea County and our state, " Haslam said in a statement. Construction of the 830,000-square-foot plant is scheduled to begin in early 2018, and tire production is slated to start by 2020. Nokian Tyres plans to acquire most of the 330-acre Rail Hub South industrial park that the city of Dayton developed north of the La-Z-Boy plant in Dayton over the past two years to accommodate a major industry needing rail access provided along the Norfolk Southern rail line. Nokian Tyres' Interim President and CEO Andrei Pantioukhov said the Dayton plant "shows our commitment to our customers in one of our most important growth areas. "The Dayton/Rhea County site was selected based on several factors, including skilled workforce availability, logistical advantages and a business-friendly administration," Pantioukhov said. Walldén said the Dayton site provides "needed capacity for growth" in the future for additional expansions as the Finish tire maker tries to move from supplying replacement tires in the secondary automotive market to becoming a first-tier supplier for new car makers. Nokian supplies tires for cars, trucks and special heavy machinery mainly in areas with special challenges for tire performance including snow, forests and harsh driving conditions in different seasons. Local officials expressed gratitude to Nokian Tyres for its commitment to Rhea County. "This investment will forever change the economic landscape of our entire region and provide hundreds of great paying jobs right here in Dayton," Dayton Mayor Gary Louallen said. Rhea County had the highest jobless rate of any of Tennessee's 95 counties last month with 8.8 percent of the workforce without jobs following the closing of Goodman Manufacturing and Fujifilm Holdings last year. Rhea County Mayor George Thacker said it was "a great regional and statewide team effort to align the resources to deliver the plan for long term success." Chattanooga State Community College will help train workers for the new plant and the Tennessee Valley Authority and the state of Tennessee offered financial incentives for the project, along with expected property tax breaks from local governments in Rhea County. Dennis Tumlin, executive director of the Rhea Economic & Tourism Council, said "our local partnership with the Greater Chattanooga Economic Partnership (created through Thrive 2055) along with the entire Team Tennessee has created this opportunity that will be felt for the next 50 years in our community." Contact staff writer Andy Sher at asher@timesfreepress.com or 615-255-0550. Follow him on Twitter @AndySher1. Finnish tire manufacturer to locate new 400-worker plant in Dayton, Tenn.